NewTechWood Advanced Capped Composite Material has a strong & durable polymer shield which fully caps the core. The Core of NewTechWood is made of 60% recycled dense wood fibre mixed with 40% high grade recycled plastics (HDPE). 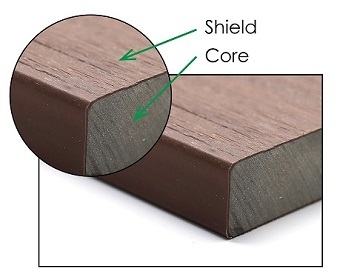 The Shield is made of special engineering grade polymer and additives with extreme low water penetration. Using a co-extrusion process the shield is heat pressed onto the core creating an impermeable protective barrier against moisture, ultra-violet (UV), insects and bacteria. NewTechWood Composite decking and screening products are a popular, environmentally friendly alternative to natural wood as it’s weather resistant, fade resistant, stain resistant and lightweight. Requiring next to no maintenance it allows you more time to live on your deck rather than work on it. In Australia we offer the NewTechwood Product in both a composite decking and composite screening profile. All NewTechwood Decking & Screening profiles are 5.4m long in length. NewTechwood offers the 25mm thick solid decking boards and the can span at a maximum of 450mm joist spacing. The top of the NewTechwood decking boards is textured to give a more natural look and feel. The textured surface has an R11 Slip Resistance rating. The reverse side of the board is a smoother brushed finish. The R11 Slip Rating does not apply to the brushed side. For a modern, clean look NewTechWood has designed a secret fix system where the clips are hidden in the gaps between the boards. The clip slides into the grooved edge of the board and is screwed into the joist. NewTechwood offer two types of fixing systems for you to install your decking - Mini Gap Clip or a TC-16 Clip (T Clip). Each fixing system for the NewTechWood range offer two different gap spacings between the boards - 5.5mm or 1mm. The Mini Gap Fixing system offers a 1mm gap between your composite decking boards. This fixing system is ideal for commercial installations where public safety may be an issue. The NewTechWood Mini Gap provides a smaller gap which helps to protect against high heels becoming lodged in the gap, and also prevents leaves or tree nuts from getting stuck between the boards. The TC-16 Clip system provides a uniform 5.5mm gap between boards, which is the standard for most decks in Australia. ** It is important that your NewTechWood composite decking boards are installed using the recommended hidden clip system and in accordance with the Installation Guidelines, so you do not void the warranty. When installing the composite screening boards or decking square edge boards for border boards or screening, these boards need to be top fixed rather than using the hidden fixing system. NewTechwood recommend the use of the Cap-Tor coloured coated screws for face fixing the composite decking or composite screening boards. Colours they sell are the closest match recommended to suit the NewTechWood decking and screening products. ** The recommended Metal Fixing screws are suitable for steel joists of up to 2mm in thickness. If thicker than 2mm, then you must pre-drill each hole. 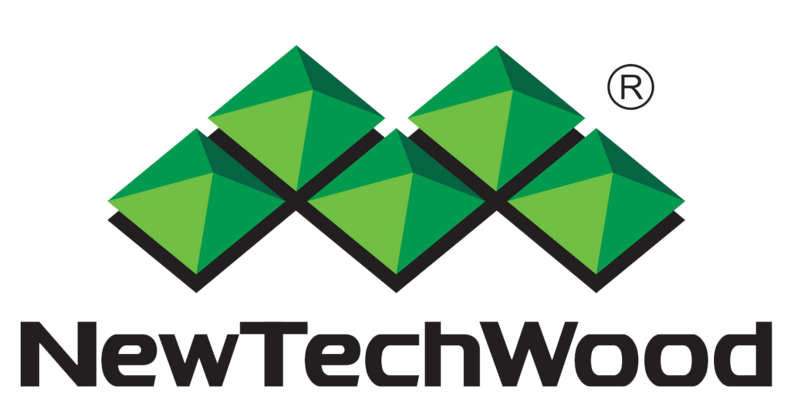 Please download and review the NewTechwood Installation guides here. NewTechwood offer a limited 25 year residential warranty and a limited 10 year commercial warranty. NewTechwood offers a Fade & Stain Resistance warranty. NewTechWood decking requires little time for you to maintain it. No more sanding and oiling your deck! Of course, your deck will get dusty and dirty from normal living. To keep it looking at its best, regularly clean it with water using a mop or broom to remove any built up dirt. If you spill red wine, soy sauce, oil or other foodstuffs on the deck the best thing to do is to flush it immediately with water, and lightly scrub with warm soapy water. To avoid scratching the deck, place furniture pads (or small squares of carpet) under your outdoor chairs. This will stop scratches from constantly sliding chairs in and out. Around the pool, decking boards will not suffer from chlorinated pool water. However, be careful not to spill undiluted chlorine or pool salt directly onto the boards, as these are strong chemicals and may stain the boards. We highly recommend mixing your pool solutions away from the deck.